Is this an accurate title? Yes. 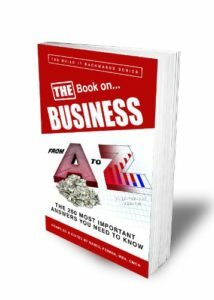 It’s an authoritative book published in 2012 packed with valuable explanations by a bevy of expert practitioners in 26 chapter topics – important issues that perplex businesspeople. What’s more, its 286 pages in paperback are easy-to-understand. For example, one of the topics is innovation – a major dilemma for businesses in the new economy. Actually, competitiveness has long been a big quandary. Innovation uncertainties cause insomnia for a lot of businesspeople. So if you’re delaying innovation because of uncertainty, the tone of the book’s chapter on innovation will put you at-ease. “Tip: Relax. There are no right answers. There are only best guesses,” writes one of the authors, Ted Whetstone. Mr. Whetstone is president of breakthruthink (www.breakthruthink.com), a consulting firm in Santa Monica, Calif.
“While innovation stresses something new or discovered (like the idea of the first light bulb), innovation tends to build off that discovery, bring it to market, and give it value, because it means something to the world,” he explains. He acknowledges that not all ideas work, but he provides readers with what I’d call ample optimistic-empowerment. “Tip: Trust your gut. But also test your ideas. Rarely is innovation successful on the first attempt,” explains Mr. Whetstone. Mr. Whetstone explains four types of innovation – disruptive, product, process and market. “The key to successfully generating ideas is to remove thought obstacles,” advises Mr. Whetstone. “This is best accomplished by assigning one person to facilitate a group. That’s a sagacious insight. Typically, dysfunctional organizations have stakeholders who insist on filtering ideas prematurely. Those organizations are unsuccessful. Mr. Whetstone also provides bulleted lists on how to capture and filter ideas for innovation. They are designed to help you be detached and objective in your deliberations. Among his other recommendations, perhaps most importantly, he explains how to stimulate and maintain an innovation culture. It’s important to sustain an innovative culture for the long-term. Ask the folks at Apple. No business will succeed without positive cash flow. In all, Mr. Siciliano answers 10 questions about cash flow. In answer to the question, “What should you expect to experience in collecting cash from a mix of credit customers that includes both large and small businesses,” he gives eight scenario answers to help you predict patterns of payment behavior. Is the cash shortage really temporary or does this happen with regularity? What could you have done to avoid this? Do you really need to spend cash for non-essential items today? Are you clear about the difference between what you need and what you want? What follows is well worth reading – several of his ideas to solve the short-term cash-flow headache. Accounting, branding, debt, equity, forecasting and budgeting, generational issues, human resources, jurisprudence, knowledge management, leadership, marketing, networking, operations, process improvement, quality, risk, strategy, turnaround, underperformance issues, valuation, when to negotiate vs. mediate, X-ray your organization, yield and Z-score. Available at Amazon.com, the book is compiled and edited by Daniel Feiman. As a resource, it’s a good investment for budding entrepreneurs and established businesspersons, alike. 10 Scholarly Solutions for Selling More Products — Part one of a three-part series: How to grow your small business. Small business owners face more predators than ever, which makes decision-making about growth seem very challenging. Marketing Essentials on a Shoestring Budget — Part two of a three-part series: How to grow your small business. Why do businesses sometimes falter? Management and HR for Higher Performance — Part three: How to grow your small business. In analyzing the growth rates of small businesses – every great entrepreneur has one salient quality – the ability to be an effective manager.